CLICK ON THE PLAY BUTTON IN THE CENTRE OF THE IMAGE BELOW TO HEAR THE WHOLE SONG… IT’S ALSO ON OUR NEW ALBUM WITH AROUND AN HOUR OF SONGS! An all time favourite with kids! This original arrangement of Twinkle Twinkle Little Star, with its gentle, soothing lullaby music, has extra Rainbows and Sunshine verses too. The song-story is about the moon, the sun, a rocket ship, and a satellite, as well as the traditional verse about the star at the beginning and end of the song! Listen for the sound effects which add to the experience and encourage imagination in children as they picture these images in their mind. You’ll find the words to the song on our lyrics page to help learn the words. We have for sale many original and traditional songs for little songsters…. check them out at SONGS – our nursery rhymes include Incy Wincy Spider, Row Row Row Your Boat, The Grand Old Duke of York, Ten in the Bed, The Wheels on the Bus, Old MacDonald Had a Farm, etc. And they all have our special Rainbows and Sunshine twist with fun sound effects, extra verses and a wide spread of music genres to keep it all interesting to children and adults alike! All available on our website or from iTunes – individually or as an album. We also have original videos which are in amazing 3D animation, and they tell stories in song! You can see them out at VIDEOS. Some of the Rainbows and Sunshine songs have been produced as “Signature Products” too e.g., Black and White Cow which is available as a complete matched set with a beautiful hard copy book, CD, mp3 song download, 2 videos (one of which has the lyrics to the song on the screen as the video plays) and a beautiful soft plush toy cow called “Moooo”. 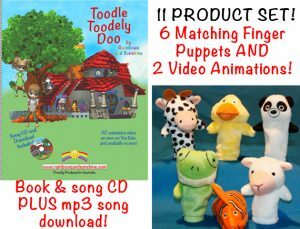 Our other signature product is Toodle Toodely Doo with it’s own book, CD, mp3 song download, 4 videos and 6 super cute finger puppets which match the characters in the book, song and videos! You can see the details for this here…..